Hello everyone, today we're proud to bring you the world first review of a superb new product! The Performance 3D Card Tapezoid from UnoAbril. UnoAbril is an Italian firm, and they gave us the opportunity to be the very first people on earth to do a review about their new and very innovative product! They realised that almost every new 3D card produces way to much heat, and tought about a solution for this problem. No, they didn't re-invent the fan, but they discovered a whole new thing! They found a special material, which I'm not allowed to call by name because it's still top secret, that has a few very interesting possibilities! But first they didn't really found a good way to put it on a graphic card, they tried almost everything! A liquid was too hard and also too dangerous to apply, so they stumbled upon tape! Yes tape. 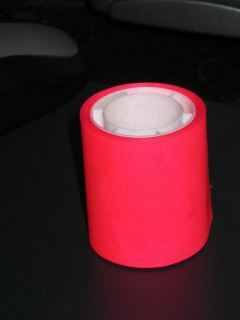 But this ain't normal tape, they put in their special ingredient which gives this tape a flashy pink 'heat absorbing' colour! 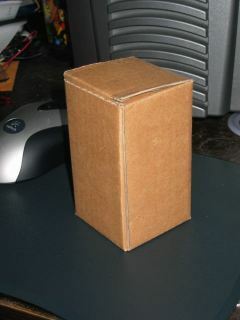 The tape came in this brown box, a nice retail package will come soon they told me. The Performance 3D Card Tapezoid is on a white plastic roll and there's enough on it for a whole year of usage! First I'll tell you how to use it and second we'll perform some benchmarks and overclocking to see what it really does! UnoAbril claims that their product 'absorbs' the heat from your GPU to lower the temperatures of your 3D Card, and that's not everything! It uses the aborbed heat to add a special matter to the 3D Card which is in the tape. 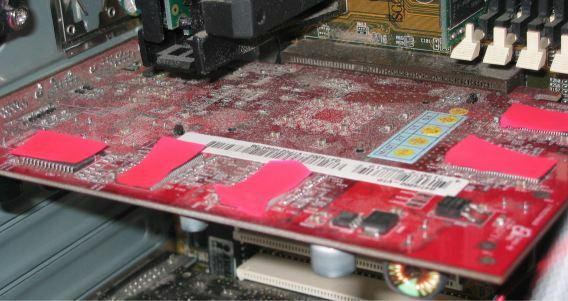 The tape converts the heat generated by your 3D Card into energy to unload their special matter out of the tape, this improves the speed of your videocard's RAM memory greatly without any form of overclocking. They claim that with this product your card should have better performance AND lower temperatures, and it's 100% safe! Even extreme overclocking should be no problem with the tapezoid. The installation is very easy. Turn off your pc, cut off some small pieces of the Performance tape, and place them on the back of your 3D card like I did on the photo. Also please notice : ONLY try this with their Performance 3D Card Tapezoid, DO NOT try this with other kinds of tape! The tape only lasts for a week, so how do you know when you need to change it? UnoAbril found an easy solution for this ; The pink colour changes into orange when you need to change it. After this I booted my PC and performed some benchmarks and compared the temperatures. All the tests were done on a GeForce 4 Ti4200 with 128MB Ram from MSI. WOW, I could barely believe it! It really works. From an already excellent 3D Mark Score of 14 327 to an amazing score of 18 759 and this was just a GF4 Ti4200! Thats 31% more Performance can you believe it! 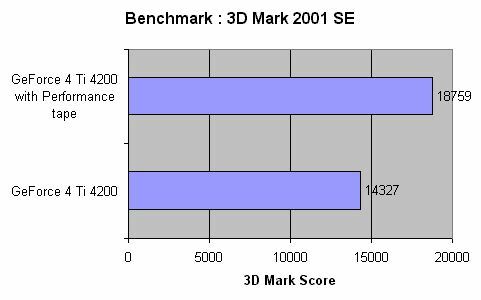 And this was just a GeForce 4 Ti4200, can you even imagine which results could be obtained with a Radeon 9700 PRO? Normally the temperature of my card is about 40°C. 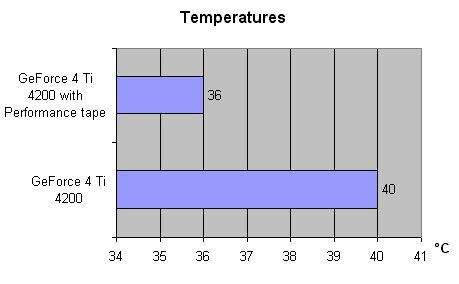 After applying the tapezoid I could notice a temperature drop of 4°C! This product is really a lot better than all the memory heatsinks for 3D Cards! I was going to question your findings until I read the last page. I guess I am a sucker but I couldn’t figure out how an old P-III could score any ware near that. All I have to say is that you're a day early!!! This was not such a good April Fools Day thing if it is not April 1st yet...great idea though!